Dec. 12, 2013 1:00 p.m.
Local songstress Elizabeth MacInnis (second from left) had a great time performing at Murphy's Pub in Leduc on Saturday, Dec. 7th. 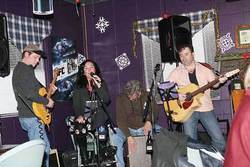 Sharing the stage with Elizabeth was her husband Trefor Gonzales on acoustic guitar (far right). Bruce Armstrong on the drum box, and Angus McNainy on electric guitar (far left). The next big name on the country music scene just might be one that people from Leduc County recognize as one of their own. Elizabeth MacInnis is a singer/songwriter that hales from right here in Leduc County but she is making waves in the music scene around the world. After taking the time to put together a strong body of work, Elizabeth decided this year that the time was right to release her debut CD. In order to best showcase her considerable talents, Elizabeth pulled out all the stops when she travelled to Los Angeles, to work with famed producer Billy Sherwood. Billy has worked with music legends such as Toto and Yes (of which he was a member) and has displayed his eclectic side by also producing an album by William Shatner. Now, he also has Elizabeth's debut album titled, ‘One Eye On The Highway’ under his belt. One Eye On The Highway could maybe best be described as an "alternative" country album. There is no mistaking the country stylings of the songs, but there are definite nods to rhythm and blues, pop, folk music and even some Celtic influences that can be heard throughout the album. Billy was obviously the perfect choice to produce Elizabeth's music as he has put together an album that showcases her voice to a "T", with a common sound running through all of the tracks that makes you feel like you are sitting in the best seat at a concert hall with Elizabeth singing only to you. The entire album has a beautiful, haunting quality to it both in the songs, her voice, and the way they are presented. One Eye On The Highway has garnered Elizabeth attention from around the globe with glowing reviews from as far away as the UK and the Netherlands. But don't think for one moment that means Elizabeth doesn't have a large fan base right here at home. As of this week Elizabeth is #1 on the charts in Edmonton for alt. country on Reverbnation, and her newly released five song Christmas EP is #11 globally on the Air Play Direct Charts! Speaking of her brand new Christmas EP titled, ‘That's What Christmas Means To Me’, these five original songs definitely lean more towards jazz stylings as opposed to country with the exception of Christmas Time Is Here, which seemingly transports a person back in time to when the family gathered 'round the tree on Christmas Eve with Bing Crosby crooning about a White Christmas in the background. Just released globally two weeks ago, this song should become a Yuletide classic. The release of One Eye On The Highway has already sent this lovely local lady travelling across North America spinning her musical web to draw in thousands of new fans across the country. But a recent development is now seeing Elizabeth working with a management company based in Hollywood, CA and looking forward to an exciting year in 2014 with talk of an upcoming US and European tour. As word gets out about Elizabeth's vocal talents, new doors are opening up as she is also being sought out for television and radio work. With all this success coming her way one wouldn't be surprised to hear that Elizabeth only accepts offers to play at big name venues and events anymore, but nothing could be further from the truth! With her true love being singing and performing she is most at home on a stage of any size and is more than happy to pick up a microphone and entertain a crowd at almost any time and place. This was easy to see as Elizabeth, accompanied on acoustic guitar by her husband Trefor, recently played for an evening at Murphy's Pub in Leduc. There was no such thing as "set breaks" when Elizabeth stepped on stage as her sheer love of singing was obvious with a seemingly endless repertoire of pop, rock and country classics that were joyfully performed. As the evening progressed the band grew in numbers as musician friends stopped by and were convinced to join Elizabeth and Trefor onstage. By the end of the evening the original duo had turned into a five piece band and had much of the audience singing along while others took to the dance floor. It is plain to see that the future holds great things for Elizabeth MacInnis and people from this area will one day be able to say "I knew her when…!" But no matter how much success Elizabeth experiences due to her vocal and songwriting talents and where in the world it takes her, she is an Alberta girl born and bred and Leduc County will always be home. Both of Elizabeth's albums can be purchased through iTunes or you can hear her Christmas album on reverbnation.com.